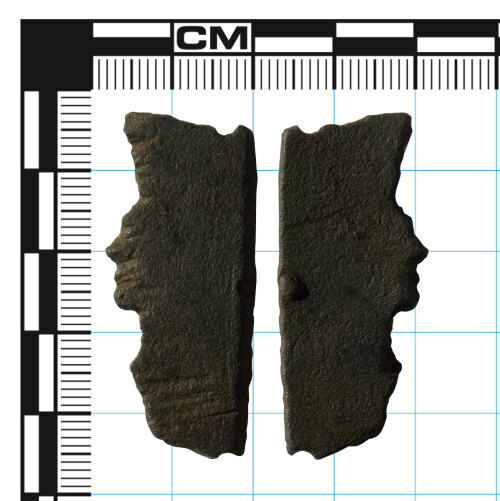 A fragment of a bronze vessel or possibly waste from metal working. With pronounced file marks to one side of one edge. There are an additonal set of file marks at the bottom of the same side. There are no file marks on the other side. However there is what looks like the remains of a rivet or nodule on the back edge. At either end is a half circular hole or indent. The fragment is dark green in colour with a different colour bronze where the hole or nodule is. The file marks are the same colour as overall suggesting they are contemporary with the fragments creation.